Rasmalai and rasgullas actually need no introduction. These culinary classics have fans worldwide for the right reasons. While rasgullas are cheesy, soft pillows cooked in cardamom scented sugar syrup, rasmalai goes two steps ahead and attains a rich avatar. Rasgullas dunked in sweetened, thick milk with accentuated flavors of cardamom, saffron and a garnishing of nuts becomes rasmalai. 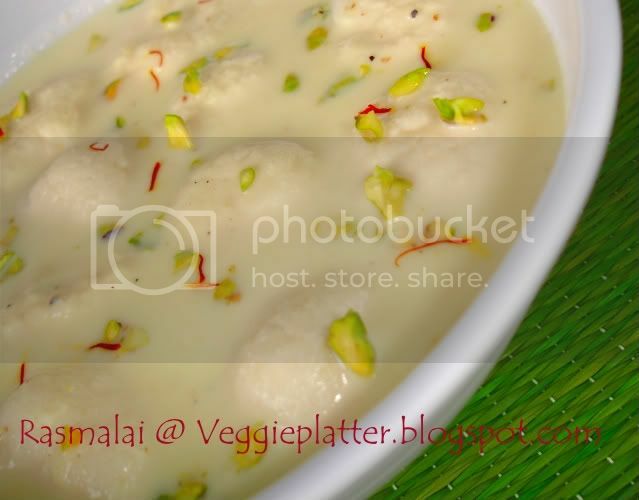 Since rasmalai recipe needs rasgullas, I tried both of them and am providing the recipes here, to woo your guests. Boil 2 litres of milk and let it cool. Boiling milk in a non - stick pan is a good idea since the milk doesn't stick to the bottom of the pan. This also translates into less stirring and less after - clean up. Refrigerate the milk for 12 hours. (I chose to boil the milk in the evening and refrigerated the milk overnight.) The next day or after 12 hours, remove the skin layer formed on the milk. Now boil the milk again and add vinegar to it. The milk starts to curdle at this point. Turn off the stove and let it settle for 5 - 10 minutes. The milk will separate into a solid mass, chena and whey, the liquid part. The chena floats to the surface and the liquid part remains at the bottom. Line a colander with a muslin or a thin cotton cloth and place it in the sink. Pour the chena -whey mixture into the cloth - covered colander. Or you can also place a container/bowl under the colander if you want to collect the whey. (The chena gets collected in the colander and whey gets collected in the bottom container.) Holding the 4 edges of the cloth carefully, run cold water directly over the chena and wash it to get rid of vinegar residue. Tie the ends of the cloth and hang the bundle at a height (like to kitchen sink tap)for about an hour, till the whey water separates from the chena. Collected whey water can be used to make roti dough or in making soups. Srivalli mentions that whey water can be left outside for about a week to go sour and then can be refrigerated to use it to make next batch paneer/chena. It would be good for about one year. After an hour, wring the cloth bundle to get rid of any remaining water. Then remove the knot and transfer the chena to a mixing bowl or a wide plate. Knead the chena for at least five - six minutes (as you do roti dough) till there is no trace of moisture and is soft. This step is crucial for not the balls to break during the cooking process. Add 3 cups water and about 3/4 cup of sugar (or more according to taste)to a wide-bottomed pressure cooker and bring it to a boil. When it boils, slide the chena balls one by one slowly into the sugar solution. Close the lid of the cooker / pan and cook it till you hear 4 whistles or cook slowly in a thick bottomed vessel, covered till they are done. Now when the valve pressure is gone, remove the lid. The chena balls / rasgullas would have become bigger in size. If the chena is kneaded well enough, the balls don't fall apart. Add 1/8 tsp cardamom powder to the sugar solution and stir. Now rasgullas are ready to serve or to use in the rasmalai. When you start to prepare chena, simultaneously start to prepare rasa in a non - stick pan. This step can be done in advance as well. Bring to boil one litre / about 4 cups of milk and turn down the flame. Reduce the milk quantity to half with constant stirring. Add about six Tbsp of sugar, crushed saffron and 1/8 tsp cardamom powder to the reduced milk and stir well. 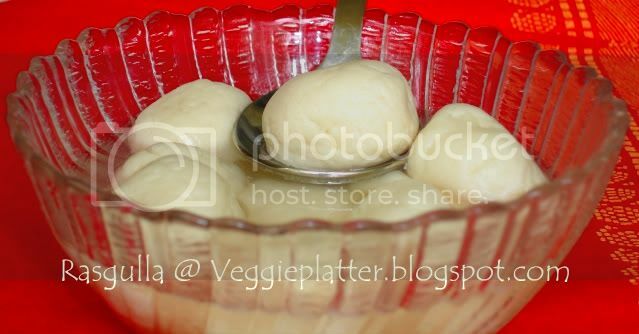 Use a slotted spoon and take out a rasgulla and gently press the ball to get rid of the excess sugar syrup using backside of a spoon. Repeat the step with the other rasgullas that are going to be used in the rasmalai. Add rasgullas to the rasa/milk syrup. Cool the rasmalai and refrigerate it. Garnish with chopped pistachios (and almonds) before serving. 1. I have used more sugar than the original recipe as I prepared rasgullas as well. 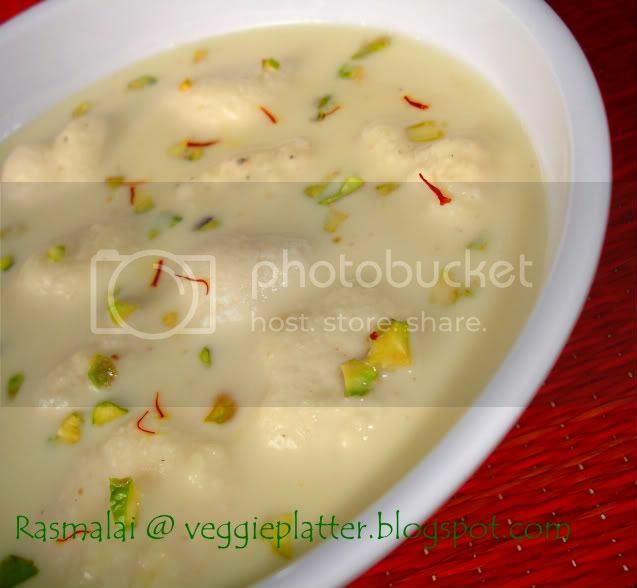 If preparing rasmalai alone, 6 Tbsp of sugar is enough for the rasa/milk syrup and about 8 - 10 Tbsp of sugar for the sugar syrup to cook rasgullas. 2. Since this quantity milk makes about 24 chena balls, I used half for rasgullas and half for rasmalai recipe. 3. This is a traditional recipe. For short cut method, instead of preparing milk for rasa/milk syrup, go ahead with evaporated milk. Store bought rasgullas work fine for time constrained moments.